In this post I’ll focus on the privacy aspect of secure websites only —the extent to which communication is protected from eavesdroppers. Issues of trust are just as important, but I’ll have to discuss those in a future post. As you can see, there are five different encryption protocols listed, in increasing order of strength. Generally speaking, TLS is better than SSL and more recent versions of TLS are better still. Published attacks on these protocols typically enable someone who can view network traffic to decrypt some or even all of the information passing over the ‘secure connection’. This type of scenario is called a ‘man in the middle attack’ because the eavesdropper stands in between your browser and the website it is communicating with. If your browser always chooses the best encryption available, why would you want to configure the specific protocols it supports? Unfortunately, the very first part of the communication between your browser and the website is more vulnerable. The two systems have to agree on an encryption protocol to use before they can be truly private. In some special cases it is possible for a man in the middle to intervene and force a weaker protocol to be negotiated. By configuring your browser to support only stronger protocols, you can ensure that your browser is never tricked this way. Here at Questionmark, we care about your security too! If a protocol like SSLv3 is considered vulnerable to interception, shouldn’t the server refuse to use it as well? Yes, it should. In fact, we don’t support SSL versions 2 and 3 for this very reason. For this blog post I’ve focused on the most visible aspect of the security protocol. In practice, there lots of subtle differences in the way each protocol can be configured. 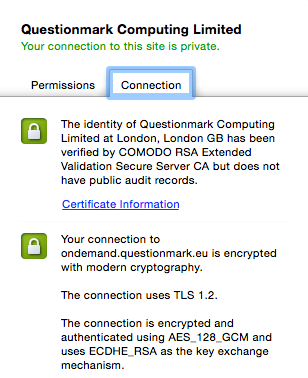 If you use Google’s Chrome browser you can click on the padlock to reveal information about connection security. Notice that this connection uses TLS 1.2, but there is even more detail reported concerning the specific cryptographic algorithms used. Sites like www.ssllabs.com have almost 50 separate check points that they can report on for a public-facing secure website! Staying on top of all this configuration complexity is critical to keeping websites secure. Unfortunately, sometimes we have to strengthen security in such a way that compatibility with older browsers is sacrificed. For example, according to the latest simulation results, Internet Explorer version 6 (running on Windows XP) is no longer able to successfully negotiate a secure connection with our OnDemand service. In practice, an overwhelming majority of users use more modern browsers (or have access to one), so the web remains both secure and usable. Perhaps a greater cause of concern is older applications that are integrated with our APIs. It is just as important to keep these applications up to date. For example, applications that use older versions of Java, such as Java 6 or have their Java runtime configuration options set inappropriately might have problems communicating to the same high standards. If you are running a custom integration and are concerned about future compatibility, please get in touch. This is a developing field. New ways of exploiting older protocols and cryptographic algorithms are being found by security researchers all the time, and the bad guys aren’t far behind. Our security specialists at Questionmark constantly monitor best practice and update the configuration of our OnDemand service to keep your communications safe.